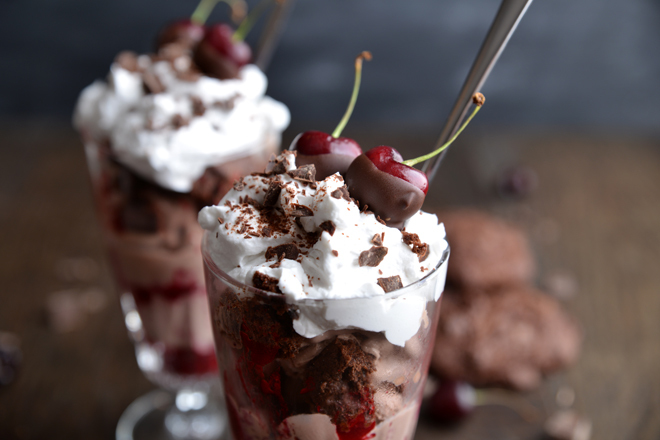 It might be Monday, but that doesn't mean you can't eat a sundae! I’m such an advocate for ice cream in winter, I actually prefer eating it in winter, you get to curl up with a blanket (preferably a festive one) put on a film (also, that could be festive too) and eat ice cream and you’re already cosy and warm. Also, if you’re going to do this you should do it properly and make a coffee or hot chocolate to go with it because cold ice cream and a hot drink, ahh if only I had a little free time to curl up on the sofa and do this right now. Quick note though; you should probably make sure the hot drink isn’t going to burn your tongue before you drink it straight after a mouthful of ice cream, because a burnt tongue is no fun. There’s something about the idea of black forest gateau that seems festive to me, is it a festive food? I say this hypothetically because if I’ve ever had a black forest gateau I don’t remember it, also it involves a lot of cream so it probably wouldn’t be my best friend. I originally planned for this to be a milkshake but damn I just love a good sundae and couldn’t resist making one of those instead. I’ve also discovered the joy of coconut cream, for some reason I’ve only just tried it, so ridiculously happy that I can eat hot chocolate cake with cream again. If it seems like a lot of effort to make cookies and sauce to go in a sundae don’t panic this cookies are so easy to make, they’re my go to “I need chocolate” recipe to make because I frequently crave chocolate but don’t want to eat chocolate - weird. The cookies are so quick to make and the berry sauce is really simple, if you don’t make it too sweet the slight tartness pairs well with the sweet the chocolate ice cream which I love, you could even not blend the sauce if you don’t want to wash up the blender (me, always) and those chocolate dipped cherries; I need a bowl of those in the fridge at all times. 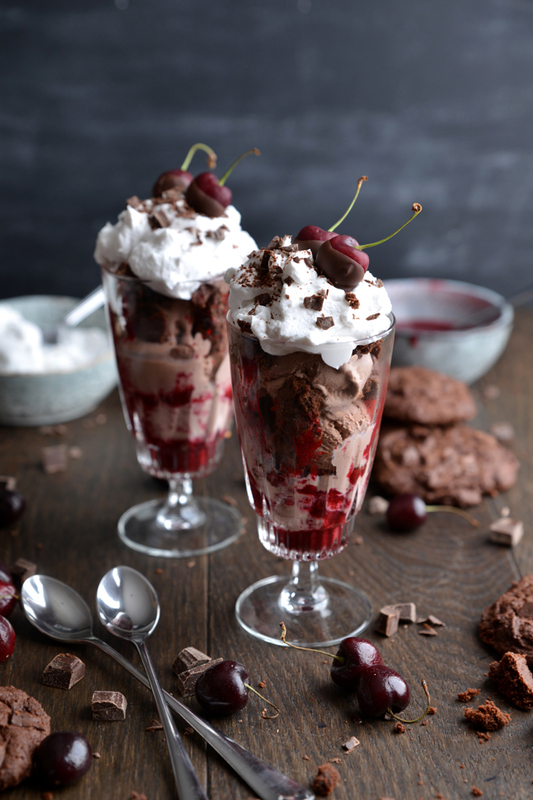 I made this a vegan sundae with chocolate soy ice cream (Swedish glace all the flippin’ way) and coconut cream but you can use your favourite chocolate ice cream and dairy cream. Let’s get to this because films need to be watched, blankets need to be snuggled under and this sundae needs to be eaten. Beat the butter and sugar together until creamy, add in the golden syrup and beat again until smooth. Stir in the chocolate, cocoa powder and flour then spoon onto a baking tray lined with grease proof paper and bake for 12-14 minutes. While the cookies are in the oven make the berry sauce. Place the berries and sugar in a sauce pan over a medium to low heat until the fruit has softened and the sugar has dissolved. Blend in a food processor then sift if desired and set aside to cool. While your sauce and cookies are cooling melt some dark chocolate, dip your cherries and refrigerate to set. 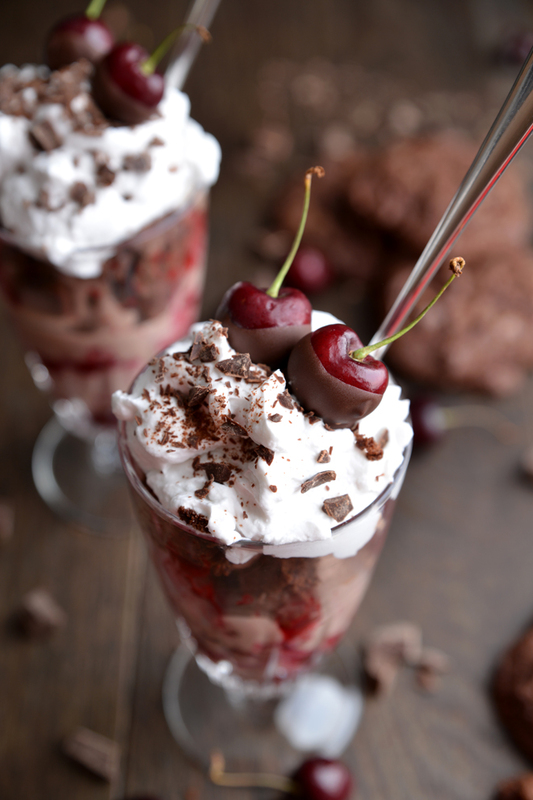 Once your cookies and sauce have cooled and your dipped cherries have set make your sundae. 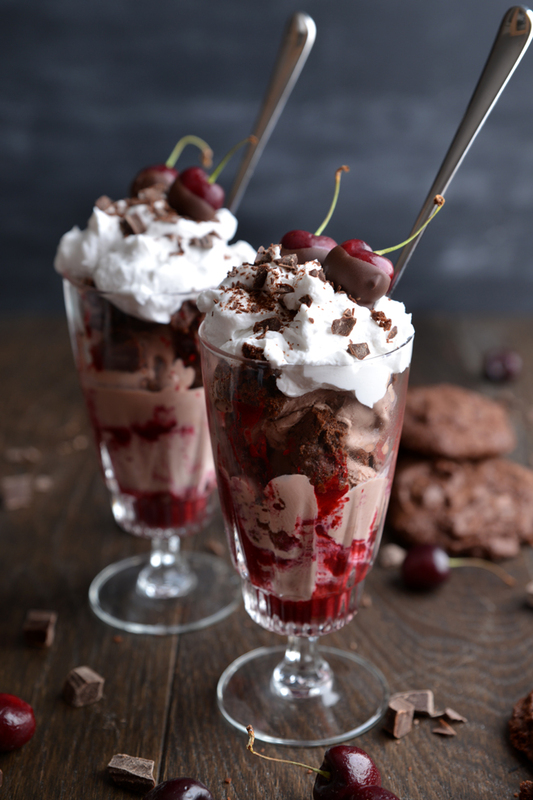 Drizzle the sauce around your glass and spoon a little in the bottle of the glass, layer ice cream, broken up cookies and sauce until you get to the top of the glass, spoon on your whipped cream, sprinkle on some chopped dark chocolate and top with your chocolate covered cherries.